Whether you're looking for a fun appetizer for a full-on party or small celebration or just a new way of enjoying a classic family favorite food, these mini food recipes are sure to please your guests' eyes as well as their palates. The best mini foods are all about delivering big taste in miniature-sized packages, and these recipes do just that. 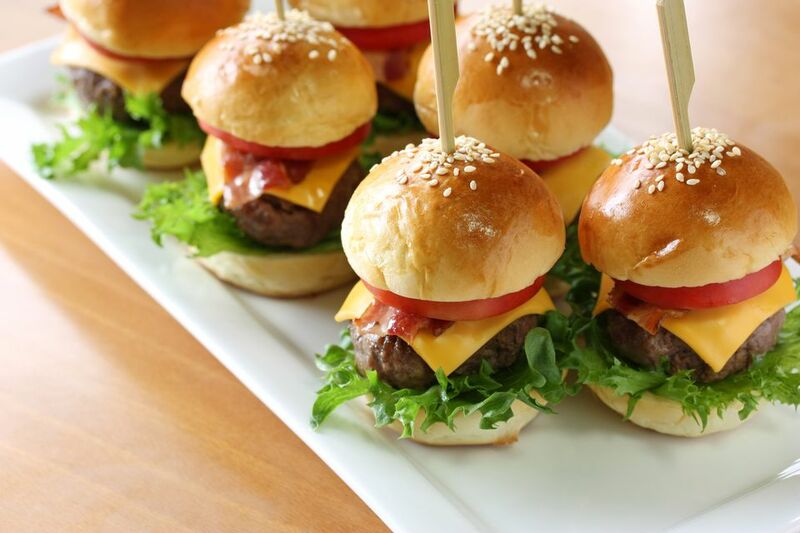 From bite-sized Big Mac-inspired beef sliders to mini pancake skewers, there are mini food recipe ideas here for everyone in the family to love! Adorable little pancake skewers are the perfect holiday breakfast idea for kids or a fun addition to a brunch buffet. Easy to make and assemble, and a treat to eat, they're a clever, no-mess way to serve pancakes—no plates or cutlery required. Kids love to help put them together, too. Feel free to use a prepared pancake mix or your own family favorite pancake recipe. 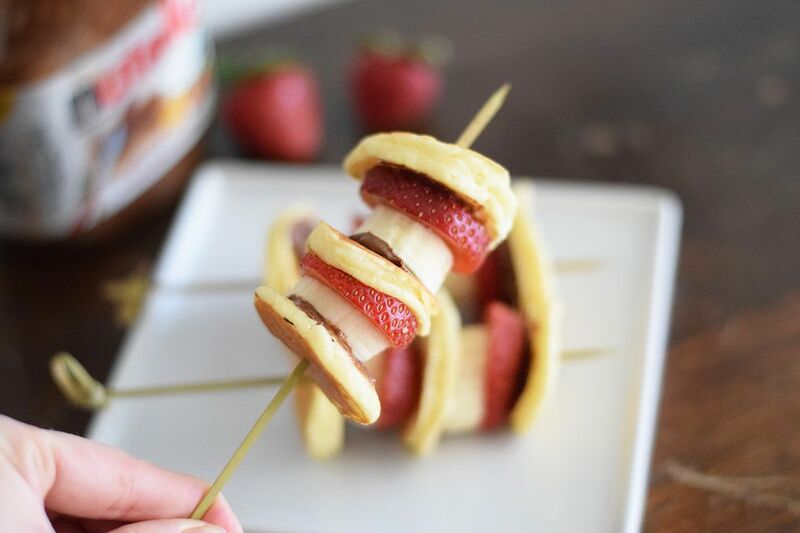 Nutella hazelnut spread makes these pancake skewers especially sweet and decadent, or you can substitute with peanut butter or jam, or a drizzle of chocolate syrup. The slices of banana and strawberry add color and nutrition. Enjoy the down-home taste of classic cherry pie, with this sweet and simple recipe that's as cute to serve as it is delicious to eat. No matter if you use prepared dough or homemade, the real trick to these little treats is baking them in a muffin tin. (You can also leave them in the tin for transporting to bake sales and potluck parties.) The sweet cherry filling can be topped with a decorative pastry design, adding even more appeal to these bite-sized desserts. Here's a fabulous recipe for your next family brunch or casual buffet party. Breakfast sausages are combined with eggs, cheese, and seasonings and baked in muffin cups, to create cute little mini frittatas. The recipe makes a delicious and satisfying breakfast dish for four people, but you can easily multiply the ingredients to serve a larger crowd. Cheesy and meaty, these yummy breakfast bites are wonderful served alongside home fries, potato pancakes, or biscuits. Macaroni and cheese is one of the most beloved American recipes of all time and a definite favorite among kids. This super-cheesy, handheld version of macaroni and cheese is made especially for the younger set, in individual portions they'll love to eat to eat on-the-go. Packed with four different kinds of cheese for ooey-gooey goodness, and some evaporated milk to add extra richness, this decadent mac and cheese is baked in muffin cups for the perfect, single-serving size. Makes a great after-school snack, or a fun family dinner anytime, with or without ketchup on the side. What's not to love about delicious beef sliders with all the satisfying flavor of a Big Mac? Enjoy the indulgent taste of these fun, home-cooked mini hamburgers that will remind you of the McDonald's menu favorite. Just like the Big Mac, these pull-apart mini burgers feature two layers of all-beef patties, special sauce, lettuce, cheese, pickles, and onions, all on—you guessed it—a (miniature) sesame seed bun. These red, white, and blue ice cream sandwiches are perfect for July 4th celebrations and cookouts, but also delicious enough to be enjoyed any time of year. Vanilla ice cream is sandwiched between two mini hand pies, one cherry and one blueberry. The ice cream is then rolled in white chocolate chips for a textured finish. It's an all-American dessert that's bursting with fresh berry flavor and the sweet creamy texture of ice cream, a winning combination. Tummy-warming and packed with savory flavors, these scrumptious mini pot pies make a wonderful party appetizer or a hearty and special side dish. A fun take on a family favorite meal, this hearty chicken pot pie recipe is prepared in a muffin tin, to create diminutive versions of quintessential comfort food. Refrigerated rolls make the crust while cooked chicken and peas and carrots in a creamy sauce make up the filling. These mini cheesecakes are quick and easy to assemble and bake, making them the perfect dessert you can pull together when you've got last-minute guests. All you need are vanilla wafers for the crust, and a simple batter that's made with sweetened cream cheese, vanilla extract, and a couple of eggs. Bake these decadent little treats in muffin cups for individual portion sizes, and top them with your favorite pie filling, preserves, or simply some sliced fruit. Delight your guests with these flavor-packed little pulled pork sandwiches at your next game day party or backyard picnic. Seasoned with Creole spices and simmered in a sweet and tangy barbecue sauce, these down-home appetizers are designed to be a hit at your next shindig. Serve them with a heaping side of coleslaw and some extra barbecue sauce, for a plateful of flavor that's sure to go down easy. Mini pizza bites are irresistible little appetizers with all your favorite pizza flavors that are ready in 30 minutes. Made with frozen mini filo shells, or rounds of prepared crescent dough, these cheesy little pizzas are super easy and are an inspired appetizer for buffet parties and appetizer parties. The versatile filling can be tweaked to add your favorite pizza ingredients, from mushrooms to chopped bell peppers, to provolone or cheddar cheese. Tacos are always a hit on game day, at summer fiestas, and, of course, on Tuesday! When they are made miniature in size, they can also be enjoyed as an appetizer or a hearty afternoon snack. The flavorful ground beef filling is seasoned with Mexican spices, then combined with cheddar cheese inside mini taco shells (tortillas cut into small circles and placed in muffin tins) and baked until they're piping hot and ready to enjoy. Once you master the basic recipe, there's no end to the tasty variations you can experiment with. Serve these delicious mini tacos with sour cream, guacamole, and salsa on the side, for a fun and filling party food. These mini key lime pie cups make a perfectly wonderful, light dessert. Adorable and delicious, these sweet little pies are ideal for serving at baby showers, bridal showers, or any event that calls for cute, one-bite handheld desserts. Best of all, they take only 20 minutes to make and are easy enough for even the most beginner baker to pull off. Pre-made mini filo cups are the base for a filling of key lime juice, sweetened condensed milk, heavy cream, and sugar. Top with a sprinkling of lime zest for a pop of color.